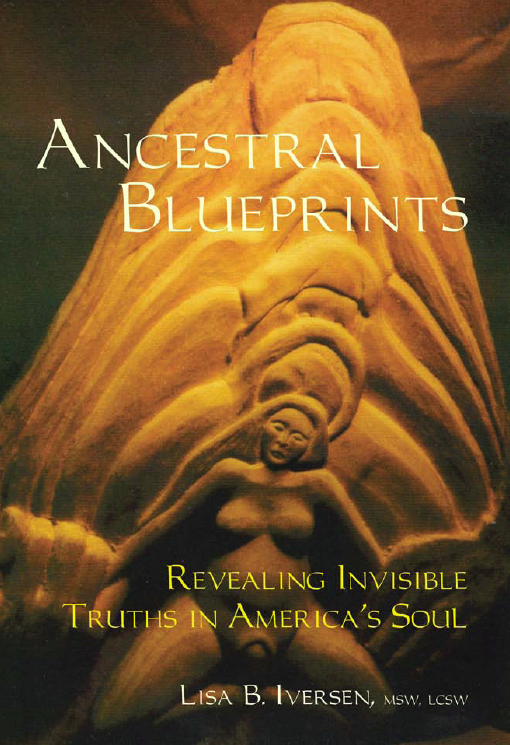 Ancestral Blueprints: Revealing Invisible Truths in America’s Soul, by Lisa Iversen, MSW, LCSW, is published by Family Constellations West Publishing. This book contains my reflections on psychotherapy, truth, ancestry, tribe, and democracy. Many people who seek therapy to heal their own pain also hope to heal wounded family networks. This hope contains the invisible, often unacknowledged truth that our lives are deeply affected by events that took place in earlier generations. Individual struggles with grief, shame, guilt, perfectionism, and dysfunctional families mirror invisible collective experiences frozen in America’s soul. We are born into the silence passed from one generation to the next, but the truth asks to be seen, heard, and respected. Our heritage, our blood lineage…Cherokee, Scottish, Irish, Chinese, German, Mexican, Jewish, Nigerian, Kenyan, the unnamed, the unknown…they all matter. This book offers a compassionate framework for observing and interacting with life, inspired by our ancestral blueprints. Book orders of one or two books will be sent via USPS Priority Mail, with delivery 2-3 business days after your order has shipped. For shipping to locations other than those listed above, ordering quantities of three or more books, and for all online book order questions, e-mail books@lisaiversen.com. Distribution is also available through Partners West Book Distributing at www.partners-west.com. "Newspaper Rock near Moab, UT" by Cacophony, obtained from Wikipedia, is licensed under CC BY-SA 3.0. Image is altered from original. Copyright © 2019 Family Constellations West. Powered by WordPress. Theme: Spacious by ThemeGrill.